UN Security Council chamber. Photo: UN Photo/Paulo Filgueiras. This is the first article in a series aimed at providing readers with an understanding of the UN Security Council. 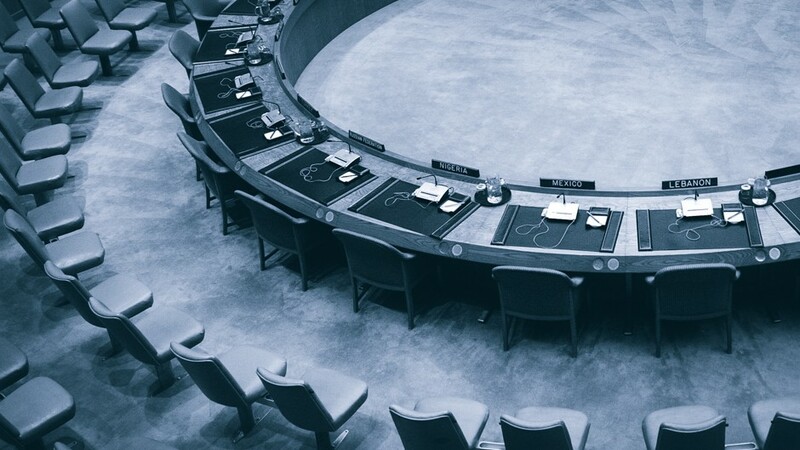 Here UNU’s own Peter Nadin offers a fundamental look at the origins, powers, instruments and activities of this premier forum in international politics. In part 2 you can learn what the UN Security Council is NOT before checking out ideas for its reform in part 3. See a full list of associated stories in the Related Articles section at the end of this page. The United Nations Security Council is the premier forum in international politics. Through its decisions, mandated operations and enforcement actions the Council directly influences the present and future state of international peace and security. This article is the first in a series aimed at providing readers with an understanding of this most important institution. It is merely an introduction. On 26 June 1945, at the San Francisco War Memorial and Performing Arts Center, representatives of fifty countries signed the Charter of the United Nations. By inscribing their humble signatures to this document they would create the United Nations — an international organization imbued with humanity’s most generous impulses: charity, hope and faith. At the centre of this organization would reside arguably the most powerful institution of international relations ever conceived — the United Nations Security Council. Under the Charter of the United Nations, the Security Council is designated as the custodian of international peace and security. It has 15 members, each with one vote. The Council has the power to define threats to the peace and act on those threats by using a range of measures including peacemaking, sanctions and even the use of force. The origins of the United Nations are found in the philosophical musings of Franklin D. Roosevelt and Winston Churchill. Roosevelt’s vision for post-war order was clear: “might be placed at the disposal of right”. For him and the other leaders this equation could only be answered by the institutionalization of the ‘Four Policemen’ concept. The idea being that in the post-war era — the Republic of China, the United States, the United Kingdom and the United Soviet Socialist Republics — should be enabled to act as the providers of security (or the ‘policemen’), while the other members of the international community would be the consumers of security. The actual blueprints for the new organization were developed by the United States State Department and the United Kingdom Commonwealth Office, and debated at ‘the Washington conversations on the creation of an international peace and security organization’ held at Dumbarton Oaks in Washington DC in the spring of 1944. At Dumbarton Oaks, discussion focused on the creation of a Council that would have the power and authority necessary to maintain international peace and security. It was envisaged that the ‘Four Policemen’, later five (with France added at a later date), would act in concert through a Council and an international armed force would carry out the enforcement of decisions, with air power providing the backbone of such a force. Command and control of these forces would be managed by a Military Staff Committee, as an extension of the Combined Chiefs of Staff system that had operated in Europe during the Second World War. The committee would consist of military representatives of the Permanent Five plus other major states, to be included on the basis of contribution. Force, however, was to be used only as a last resort. The Council possessed options and could first resort to the use of other instruments, notably sanctions. Chapter VII of the Charter sets out a very clear logical progression or escalation in a possible Council response. The first step in this progression of response is article 40, which refers to ‘provisional measures’ that can be taken in order not to inflame the situation. If compliance was not forthcoming, however, article 41 could be “employed to give effect” to the decisions of the Council. Article 41 contains a detailed list of possible sanctions that could be imposed in order to elicit compliance. If sanctions proved inadequate, step three — the final stage along the line of escalation — was the use of force; the basis for which is provided in Article 42. In simple terms, the veto power allows any permanent member to cast a negative veto to block a resolution of the Council. The veto was designed to act as an effective safeguard on the interests of the Permanent Five (P-5). This is because the permanent members could exercise the veto to protect their own interests or the interests of an ally or proxy; they could do this whenever they felt that the Council is encroaching on their ‘space’. Although, the veto can elicit paralysis, it also serves a useful function. This function is known as the concert function. By instituting the veto the UN was virtually insuring the participation of all the Great Powers. And so the world was presented with a stark choice at San Francisco in 1945, between “an organization with great power privilege” and “no organization at all”. The veto allows the permanent members to manage their interactions in regard to their interests. When they all agree, action can be taken. When they disagree, action can be blocked. Areas of contention are therefore avoided and the Great Powers are separated, effectively averting direct confrontation. The envisaged processes of response of the Council were done away with, out of sheer practicality, and the Council began to work very differently from what was imagined at the outset. In its early years, the Council dealt with the ‘questions’ of Spain, Greece, Free Trieste, Iran, Indonesia, and India-Pakistan, before taking on the now immovable Palestinian question, the Suez Crisis, the Congo, Cyprus and later South-Western Africa. In addressing these questions the Council employed the use of military observers and later interposition peacekeepers, as well as commissions of investigation; the Council even went as far as to establish an international protectorate known as the Free Territory of Trieste and deployed a UN force in the Congo. Since the end of the cold war, the previously underutilized Council became hyperactive — dealing with multiple situations across four continents. During the 1990s, the Council began to intervene in a particularly traumatic and complex series of internal conflicts. The Council launched effective assistance missions in El Salvador, Namibia, Mozambique and a more ambitious transitional administration mission in Cambodia (which was relatively effective). Emboldened by the positive outcomes, member states carrying heightened expectations grew ever more ambitious. They soon deployed large numbers of peacekeepers to Somalia and the former Yugoslavia to assist in the delivery of humanitarian aid. The conceptual ground on which missions were based was flawed and both operations were ultimately ineffective. The sudden retrenchment (a reduction in number of missions authorized) in UN peacekeeping following the hasty withdrawal of the UN Mission from Somalia (UNOSOM II) resulted, in part, in the collapse of the UN Assistance Mission for Rwanda (UNAMIR). The failure of the Security Council to halt the genocide in Rwanda is surely its supreme failure. Today, the Council generally responds to three types of situations: (1) chemical, biological, radiological and nuclear weapons proliferation; (2) international conflict; and (3) intra-state conflict. More recently, the Council has also developed a (4) crosscutting and (5) quasi-legislative agenda (table 1). Over the past 70 years, the Council has developed a set of instruments (table 2) that it has used to respond to these situations. In an increasingly complex environment, the Council has proven itself remarkably innovative. At the same time, the Council has also made significant blunders in the use of these instruments and has at times failed to learn from past mistakes. In Rwanda, Bosnia, and Somalia, the Council adopted responses that were later proven to be wholly inadequate. These abject failures damaged the credibility of the Council and tarnished the UN brand. Targeted Sanctions (Travel Bans & Assets Freezes) Targeted sanctions are designed to be more precise, and are targeted in such a way as to affect the finances and/or liberties of a targeted individual, company or non-government organization. This type of pressure applied specifically to targeted leaders, personally affects those making the decisions. The logic of targeted sanctions being that when political elites are deprived of luxury goods, international travel, their assets and access to finances, they will defer to their own personal interests; and as a consequence abandon deviant policies and pursue compliance with Security Council demands. Remonstrance (and Demand) Refers to an appeal, a request of the Council. In the context of the Council, a remonstrance is used as a form of influence, either a gentle reminder or an enforceable demand. A remonstrance is a form of words, no more, which does not carry the weight of action per se, but might accompany a threat (i.e. a specific or unspecific threat of article 41 measures) to convey its significance. Arms Embargoes Arms embargoes are the most favoured of the sanctions tools used by the Council. Such embargoes are designed to deny or restrict availability of weapons. The rationale being that limiting access to new weaponry and ammunition will limit the conflict itself. Peacemaking Encompasses the use of tools such as diplomacy and mediation to bring conflict to an end. The Council initiates, or more often supports, peacemaking efforts under Chapter VI of the Charter. Article 33 outlines the possible means through which peace can be encouraged — negotiation, enquiry, conciliation, arbitration, judicial settlement, report to regional agencies or arrangements. With the crisis in Syria entering its third year, the Council is again accused of being unable to suppress the various threats to international peace and security, which beset the world. This has led many critics to label the Council ineffective. At the heart of this criticism is the notion that the Council has “failed to act swiftly and effectively to contain international crises”. These criticisms are all valid. The Council certainly is hyperactive, reactive, selective and imperfect. But it still remains the go-to forum in a time of crisis, and is likely to remain so well into the future. United Nations Security Council 101 by Peter Nadin is licensed under a Creative Commons Attribution-NonCommercial-ShareAlike 4.0 International License.